Colorado’s mineral-rich healing pools have been around longer than human civilization — our history is dissolved in their water. Our diverse metamorphic and geological history resulted in the formation of abundant natural springs. Modern-day Colorado was home to numerous native tribes and later trappers, traders, miners and explorers. Across the state, our collection of 31 hot springs offer a variety of experiences, many of which allow visitors to soak up Colorado’s history. Iron Mountain Hot Springs in Glenwood Springs is the newest one travelers can visit and is located on the banks of the Colorado River “New” is a relative term when we’re talking about geothermic activity that has been millions of years in the making — or a town that has been celebrating the waters’ healing properties for ages. Long before the first settler came to Glenwood Springs in 1860, nomadic tribes bathed and soaked in the hot mineral waters, relishing their healing properties. Today, Glenwood Springs remains a hub of geothermal activity paired with modern-day conveniences. After profiting from the productive Mary Murphy Mine, a group of miners built a three-story hotel at what is now Mt. Princeton Hot Springs Resort in Nathrop. It took four years to build and never saw a paying customer — luckily for us, fortunes have turned significantly since then with several pools, a world-class spa, family amenities and more. Soak in mining and trading history while gazing up at the ancient and towering peaks surrounding the natural oasis. Trimble Hot Springs in Durango dates back to 1000–1200 A.D., when Ancestral Puebloans lived and roamed the region. Following the Ancestral Puebloans, various native tribes used the Animas Valley as hunting grounds and enjoyed the healing waters. In 1874, Mr. Frank Trimble moved to town with his wife. Suffering from rheumatism and old wounds, he began bathing in the waters and declared himself healed just one month later. In 1882, he built the first hotel on the grounds. After a series of owners, burned-down hotels and a 30-year-closure, the springs are open to the public and more vibrant than ever. A balance of rugged and relaxed, Strawberry Hot Springs in Steamboat Springs is today much as it was hundreds of years ago. Native Americans and early settlers were drawn to the steamy waters, and in the 1880s the property around the springs was homesteaded. After a day of soaking, enjoy accommodations that are a flash back to the past: Spend the night in a train caboose, covered wagon, tent or rustic cabin. Ranging in temperature from 85 to 134 degrees Fahrenheit, the Wiesbaden Hot Springs Spa & Lodgings in Ouray have been flowing from the San Juan Mountains for thousands of years. In the winter, the geothermal water also heats the historic hotel. Ouray was named for the great Indian Chief Ouray of the Ute Indian Tribe. Hot springs are part of the area’s history: The Uncompaghre River, which flows through Ouray, derives its name from the Ute Indian’s “unca” for hot, “pah” for water” and “gre” for springs. Valley View Hot Springs has a history as intricate and beautiful as the San Luis Valley it occupies. Founders Neil and Terry Seitz forever protected the springs, the legacy of the Everson Ranch and the surrounding ecosystem by creating the Orient Land Trust. Everson Ranch, located at the western edge of OLT's holdings is a more than 150-year-old ranch currently being renovated to maintain its historical facades and create an educational and living agricultural facility showcasing sustainable agricultural processes. Serenity is guaranteed at this clothing-optional hot spring, with a limited number of guests allowed to soak in ponds along wilderness trails. 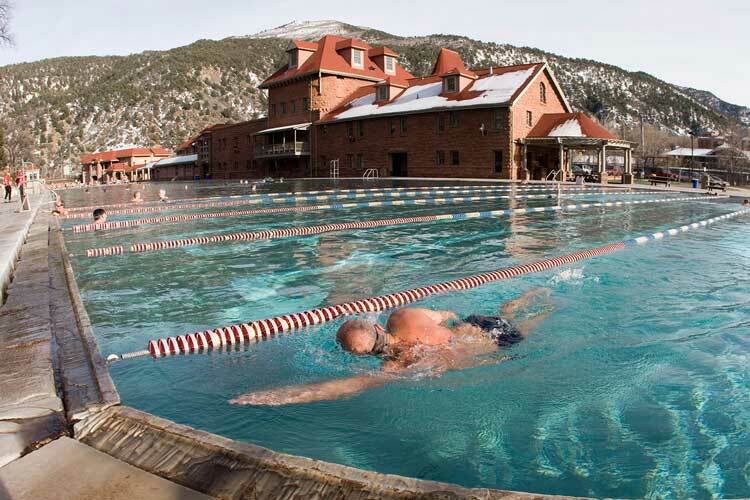 For a modern twist on an ancient tradition, Manitou Springs, celebrated by “Manitoids” (as the locals are called) in the late 1800s for its healing powers (especially of Tuberculosis), are heated by solar power and pumped into pools for a hot twist on a traditionally cool soak. Enjoy the evolution of this ancient tradition through natural mineral treatments at the new SunWater Spa and stunning views of Pikes Peak. Described by many as the "Coney Island of the West," Eldorado Springs Resort was first opened for business on July 4, 1905. Early visitors to the resort came by train or horseback, and it grew so popular that two additional swimming pools were added, one in 1905 and the present pool in 1906 — at that time advertised as the largest swimming pool in the country. Though not hot like the others above, Eldorado is a refreshing mountain retreat and is adjacent to a gem of a state park — Eldorado Canyon State Park. See all 31 Colorado hot springs.